SAN XAVIER DISTRICT, TOHONO O’ODHAM NATION, Ariz. – Tohono O’odham Mike Wilson, who puts out water for migrants dying of dehydration near the international border, said it is time to hold the Tohono O’odham Nation accountable. “If we are a sovereign nation, why does the Border Patrol run rampant on tribal lands?” said Wilson, who has ignored pressure form the tribal government to halt his effort and water stations. Wilson pointed out that the occupying army has a military camp two miles north of the international border on O’odham tribal land in Arizona. Speaking at the Border Summit of the Americas, Sept. 29 – Oct. 1, Wilson described migrants dying of thirst on tribal land, including a seven-year old girl with blood in her urine, who barely survived. “We who were once oppressed, are ever increasingly becoming the oppressor,” Wilson said. Wilson said he does volunteer work with Humane Borders off tribal land, but his actions on tribal land are as an individual. The tribal government has halted humanitarian groups from coming onto tribal land to render aid. Wilson said that he asked former Tohono O’odham Chairman Edward Manuel whether the Tohono O’Odham Legislative Council was ever consulted before the United States’ Operation Gatekeeper or Operation Hold the Line were launched. Those two operations funneled migrants onto tribal land, where they often died in the desert. Wilson said Chairman Manuel confirmed that O’odham were never consulted. Wilson said after he began putting out water for migrants five years ago, he was told to cease by the Tohono O’odham Attorney General’s Office and Superintendent of Public Safety. Referring to the threat, Wilson said, “Why is it that non-O’odham in positions of power feel they can threaten and intimidate O’odham people? “They thought they had a dumb Indian on their hands.” After Wilson contacted the media, the non-Indian officials changed their story. Then, they said they were just advising Wilson of his Constitutional rights. Wilson said he began to put out water for migrants when they began to die in disproportionate numbers in 2001. There were 240 to 250 migrants dying each year in the Sonoran Desert. Of those 70 to 90 were dying on O’Odham lands. “No one was doing anything to prevent migrant deaths, especially the Tohono O’odham government,” he said. Wilson said his battle is with the Tohono O’odham Nation who is not taking any action to prevent migrants deaths. Wilson said the lack of accountability and silence does not honor him as a Native American. “This says, ‘Native American people, you are incapable of being held at the same level of accountability as the rest of society. We will lower this moral bar. “Why? ‘Well you’re Natives.’” Wilson said since the time when the first missionaries arrived here, that “Native peoples were treated as not fully human, people without reason, without the intellectual and moral accountability to be held responsible. Wilson said O’odham, too, are migrants and most have moved about for work during their lives. “As an O’odham, treat me as a human being; treat me as a citizen. Praise me when I am worthy of praise, criticism me when I have it coming,” he said. “But too often the response is, “Oooo, they are Indians, they have a monopoly on spiritually. No, we do not. All human life is sacred. “The Creator created us all equal. Stop belittling us, stop insulting us and treating us in mythical terms, and even more dangerous, in mystical terms. We are fully human, we have the good side and we have the bad side. Wilson appears in the film, “Crossing Arizona,” shown at the Border Summit, which includes his efforts. During the summit, he shared more of one migrant man’s story documented in the film. Wilson said he told the man in the desert that if he goes north, he would be dead in a few hours. The man said he would rather die in the desert than return to Mexico and watch his wife, who needs surgery, and his children, starve to death. Wilson said many of those dying in the desert are Indigenous Peoples, from Chiapas, Guatemala, Honduras and other countries in the south. Wilson said O’odham have been hiding behind the white man’s guilt for the past 400 years, to keep from being held accountable. Wilson said his water stations are being damaged and his water gallons slashed. He said it is likely tribal members destroying the water stations of barrels and gallon jugs that he replenishes each week. Still, Wilson urged people to find common ground, even with the Minutemen and Border Patrol individuals. Wilson said poverty can make a person weak, or it can make a person strong. It made him strong. He picked cotton and labored on weekends, beginning in sixth grade. He remembers what it is like to be hungry. 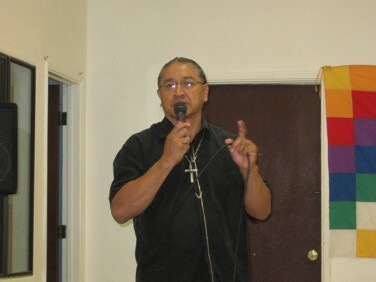 At the summit held in San Xavier District, where he was born, Wilson was praised by members of the International Indian Treaty Council and the American Indian Movement. Those attending told him that he is one man who has made a difference and walked his talk. Wilson, a former Presbyterian lay minister, left his church in Sells, Ariz., on tribal land, when they voted to forbide him to put out water for migrants. Now, Wilson remembers at times the harassment by border agents, sometimes believing they are “Superman,” and belittling O’odham.